Speed. Life today moves along at an ever-quickening pace. Visual artists, affected by the accelerating tempo of their lives, respond in a visual way. They create art where the fast pace of life is made manifest. 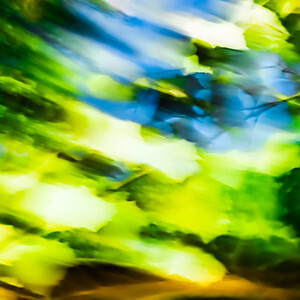 My recent photographic work is strongly influenced by the accelerating pace of modern life. This influence extends not only to the images themselves but also to my capture and field techniques. Like the artists of the Futurist avant-garde at the beginning of the 20th century, my photographs capture the speed and energy of my photographic subjects evoking a correspondence between the energy of movement and the pace of modern life. I am not trying to create a depiction of movement, but rather to record a more complete impression of the world around me. That world is full of movement, and speed, and rapid change. My moving-camera capture technique abstracts my subjects, by obscuring detail, producing and altering form, and creating surface pattern. Moving the camera at time of capture allows me to contribute my spontaneous physical response to the photographic composition that exists before me. My own movement, not the movement of my subjects, embodies the accelerated pace of modern life. I become a performance artist, a choreographer, a painter, and a creator in the photographic realm. Black Rock’s Kay Gallery, with it’s natural light, provides an environment for my work that makes possible a connection between the energy of my photographs and the busy and culturally exciting environment surrounding the Black Rock Center. The larged size of my photographs fills the gallery with movement. I have organized the tempo of this exhibition into a dance-like composition. The exhibition has a beginning and an end. Its two sections, along the two long walls of the gallery, gradually accelerate the pace of the composition, with the moderately fast allegretto tempo on one wall amping-up to become a very fast presto tempo on the other. The entire exhibition-composition culminates in frenetic movement creating a visual impression of the accelerated pace of our lives today. The last photograph, unable to be contained in the gallery any longer, streaks up and out the door. The Light Ekphrastic invited Dottie Campbell to participate in their collaborative project with LED Baltimore. The Light Ekphrastic is an online journal that inspires writer/artist collaborations. The writer and the artist each create new work that has been inspired by their partner’s work. LED Baltimore’s ninety-foot digital billboard on Charles Street in Baltimore was used as a digital art display for this project. Dottie Campbell was partnered with Tracy Dimond, a Baltimore poet. Dottie’s image Queen Calafia’s Morning Mirror was inspired by Tracy’s poem Lost Time And Gloves and Tracy’s poem Maintain Effervescence was inspired by Dottie’s image Dragon Dreams. On the LED billboard, excerpts from Tracy’s two poems appeared on Dottie’s images. See the Photographs and Poems here. Dottie Campbell was invited to create an online portfolio on the international Lens Culture magazine. The British newspaper, The Guardian, cited LensCulture as one of the eighth best photography websites or online publications in the world. Will Coldwell, writing in The Independent in 2013, described LensCulture as a "definitive resource for anyone who wants to keep up with the latest trends and debates in contemporary photography". 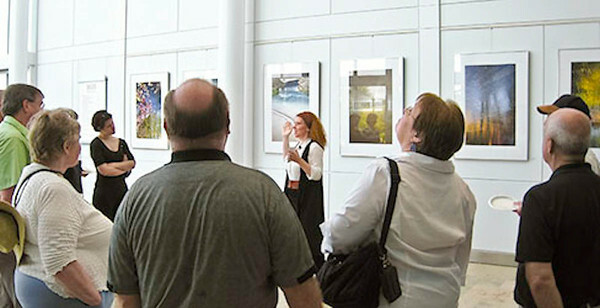 Ten photographic portfolios are presented with descriptions of each portfolio project. ❍ The exhibition gallery of DC Campbell Studio is open by appointment at The Mill Center building located in the Baltimore village of Hampden. The studio is on the third floor in Studio #349. Call Dottie Campbell at 410-243-0475 for an appointment. Exhibitions change every two months starting in June. 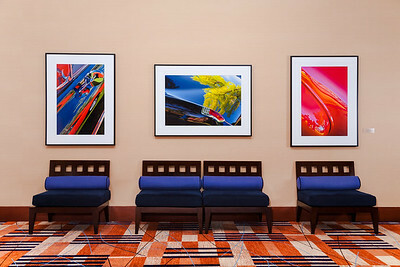 ❍ Six 36” x 48” photographs from the Vehicular Landscape portfolio are on permanent view in the third floor public area of the Hilton Hotel in downtown Baltimore, Maryland. Take the elevator to the third floor. Included in this group is the winner of the National Geographic Photography Contests, Black Buick Cottonwood. Additional photographs from various portfolios can be found in the Executive and Presidential Suites.